Living in Texas gave us an appreciation for good barbecue. We tried the ribs and brisket in almost every restaurant within 45 miles. In our opinion, the best ribs were at The Gristmill. It was located in a small town called Gruene, home of the oldest dance hall in Texas. The best brisket was at Rudy’s. They served it on waxed paper with all the white bread you could eat. Mmmmm…was it good! Fattening for sure…but delicious! My stepfather, Steve (AKA Bubba by his grandkids), has been attempting to master an allergy free brisket for the past year or so. He and my Mom would come to visit us in their fifth wheel trailer all the way from Massachusetts every year and stay for about a month. They just so happened to stay at a campground that was the half way point from us and both The Gristmill and Rudy’s (coincidence?). They were hooked to the barbecue just as much as we were! 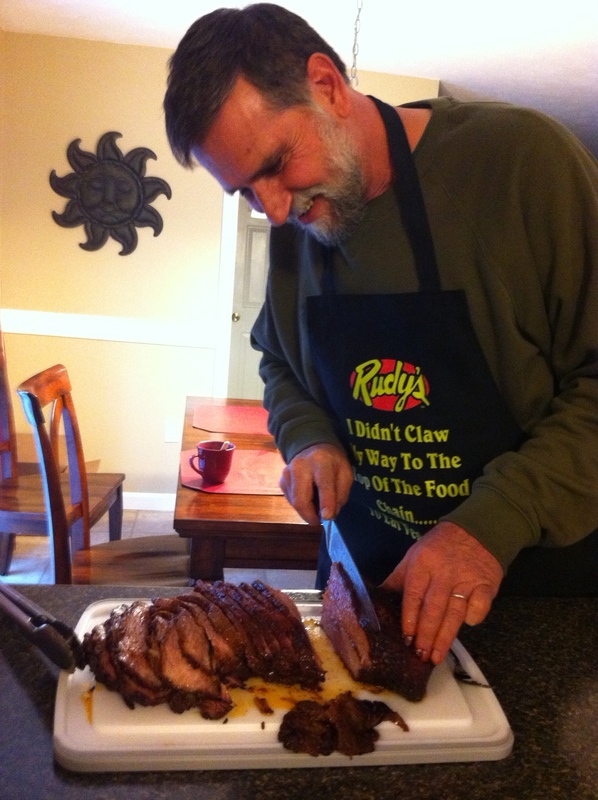 Recently, Steve made a brisket that blew Rudy’s away! Even better? it was allergy free!!! Even as I type this my mouth is watering…remembering how juicy and flavorful each and every bite was! Mmmm….no really…it was THAT good!!! with the results!!! and so were we!!! Steve allowed me to share with all of you just exactly what he does to make that absolutely delicious allergy free brisket. Thank you Steve!!! 🙂 He uses a dry rub (which he calls Ryan Rub because it’s allergy free), dijon mustard and apple juice. Because Steve gets a very large brisket and smokes it at a low temperature for hours, he wakes up at 4am!!! Crazy I know, but sooooo worth it. Adjust the smoker to a temperature of 175 degrees. Rub the brisket with the dijon mustard. Add the Ryan Rub to the brisket until it’s completely covered. Cook in smoker for three hours. Squirt brisket with apple juice and continue to do so every hour until the internal temperature reaches 170 degrees. Take brisket out of smoker and wrap in heavy duty aluminum foil. Place in a cooler and pack the cooler with towels for 2-3 hours. 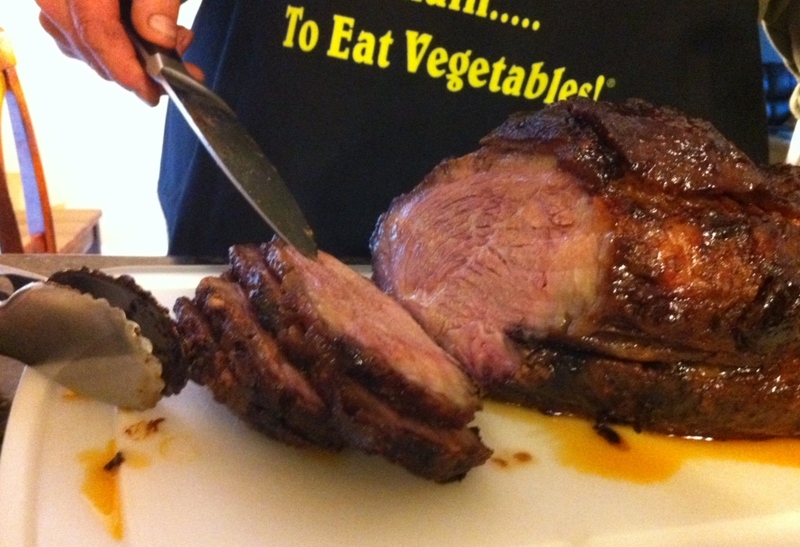 Unwrap your brisket and slice across the grain…and enjoy!! Oh yeah! To make it even better, don’t forget the Sissy Sauce from Rudy’s!!! Yes, I’m using the same picture as above. Do you blame me? Look at it!!! Angela, you have no idea how good it was. Lucky for us he's making another one for Easter! YUM!